The Crow is on the verge of becoming one of those reboot/sequels we hear a lot about, but never actually see happen. After numerous actors and directors have come and gone, Relativity seemed like they were finally ready to move forward, hiring music video director Corin Hardy to take the helm, and targeting Luke Evans as the lead. The movie was supposed to start shooting this spring. That doesn't look like it will actually happen now, and reiterating previously made statements, Luke Evans still doesn't even know if he'll be able to make the movie or not due to his schedule. Talking with HitFix, Luke Evans simply can't give a straight answer on whether or not he will star as Eric Draven. His schedule is completely full for the next twelve months, so if he does take the lead, it won't start shooting until at least the second quarter of 2016. Apparently, the actor doesn't even know what Relativity has planned at this point in time, other than that there is a new director attached. "Right now I'm not sure where it is, I don't know what's happening with it. I think it's a question probably to ask [distributor] Relativity...they're the ones who are really holding the strings to this story and this character. But yeah, I don't think it's gonna be something I'm gonna be doing for a while. I've got about four or five different projects which I'm lining up for this year, which will take up the majority of my 12 months. So not in the near future, unfortunately." 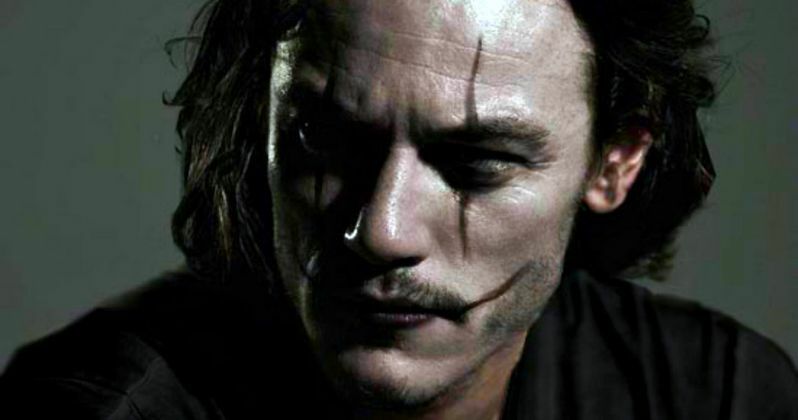 Last year, Luke Evans was quoted as saying that previous director F. Javier Gutiérrez was making a movie that more closely followed the comic books, making it a departure from the original 1994 The Crow. He's not so sure that's the case anymore. "It'll be a different concept, a different director, a different script, and who knows where it will go? I mean, when I was in conversations with everybody it was about being as honorable to the book and loyal to the book as possible. And that meant it would be a very different film to the one that was made with Brandon Lee. Which was a good thing in a way. I mean, it wasn't that we were trying to replicate something. It was, we were gonna go back to the book and be as completely truthful as possible. But who knows where it'll go? And who knows whether I'll be playing it or somebody else." Just yesterday, director Corin Hardy was at Sundance, where he revealed the movie will stay pretty close to James O'Barr's original vision. "I'm very much going back to the graphic novel, particularly looking into the illustrations themselves as much as the story, and picking out all those beautiful ideas and details that haven't really been used yet." From the sounds of it, The Crow certainly won't be ready for an April 2015 start date. That may be okay, as there are plenty of super hero and comic book movies on the very near horizon. What do you think? Do you want to see Luke Evans as Eric Draven? Or should he leave this job in the dust for yet another actor to pick up?